2-in-1 design: The stylus tip is made of 1.6mm fine processed copper, and it is elastic. This design gives a more real feel of writing, drawing and sketching. The conductive fiber tip cap on the stylus bottom can protect the usb port from damage and dirty, and it is also workable even the pen is power off . Rechargeable: Built in battery is able to work continuously 20 hours and only charged 1-2 hours. Power Saver: Automatic stand-by mode saves a plenty of battery and makes the actual working time much longer. Note:Not match to Windows system and ipad Air 2.
: 1.Please do not use while charging. Exquisite Design: The stylus is made of high-quality aluminum alloy. The stylus is adapted 2-in-1 design, including a fine processed copper tip and a conductive fiber tip.The size of the stylus like a regular pen, which offers a more natural writing experience for you. Sensitive and Smooth: The latest technology reduces off set and lag time between fine tip and trace.The1.6mm ultra fine tip gives you the accuracy you need and provides superior control and traction against tablet screens. In addition, attached anti-fouling glove is able to avoid palm rejection. 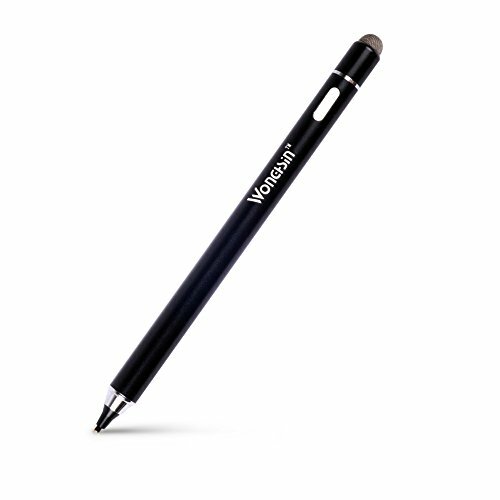 Long working hours: With the built-in battery, the pen is able to work continuously for 20 hours after charging 1~2 hour. The automatic stand-by mode makes the actual working time much longer (the pen will be power cut automatically without any operation for 5 minutes). And it is also able to work by using conductive fiber tip even the pen is power off. Wide Compatibility: The stylus pen matches to most touch screen devices such as iPhone, iPad, Samsung and others. It works directly without set up, no Bluetooth or app required. Note: Windows system is not matched. What you get: 2 in 1stylus pen * 1 , Anti-fouling glove * 1, Pen bag * 1, lanyard cap * 1, lanyard *1, micro usb charging cable*1, User manual *1, 7*24 Customer Service and 12 months warranty.